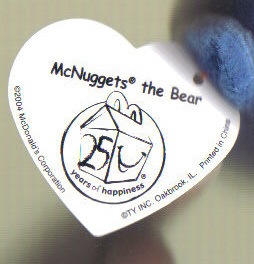 In 2004 McDonald's celebrated it's 25th Anniversary of the Happy Meal with Ty's famous Teenie Beanie Babies! 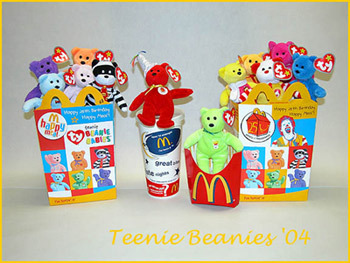 Starting July 23rd through August 19th McDonald's will have Teenie Beanie's in their Happy Meals! 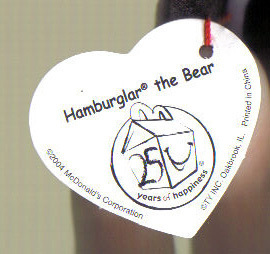 12 different Beanies will be available, each Teenie Beanie will represent a piece of McDonald's famous history! 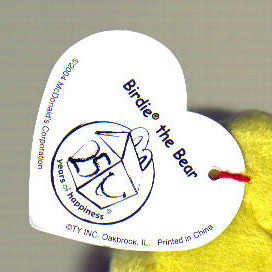 Click here for a printable checklist of all Teenies this year! 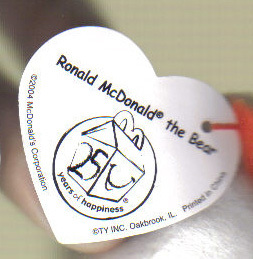 Each Teenie is listed in the order in which it was released, Symbol shows a pictures of the patch on the chest of each Teenie. 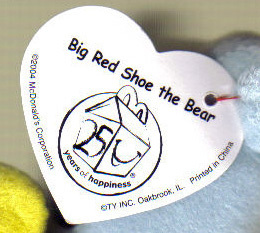 Thank you to Sue for the many pictures of the tags and patches! 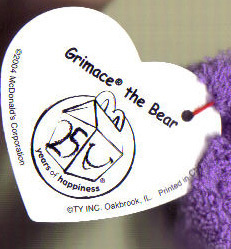 All McDonald's Teenie Beanies given away in Canada have their English and French names printed on them, and the main difference is the first Bear in the series has a different name. 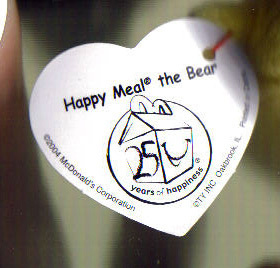 In Canada #1 Happy Meal 25th Bear is actually called Happy Meal 10th Bear. 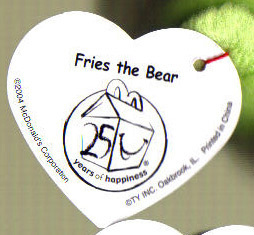 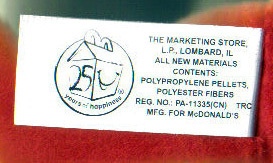 The 25 is suppose to represent the 25 year anniversary of the Happy Meal. 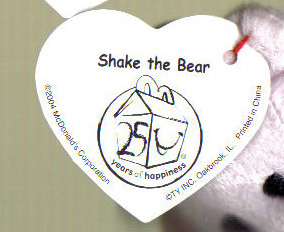 It is non yet known why the Canadian ones say 10, and what the 10 is suppose to mean. 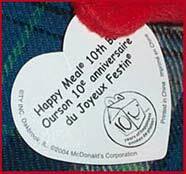 Some thought maybe it was 10 years of Happy Meals in Canada, however it was later determined that Happy Meals have been in Canada more then 10 years. 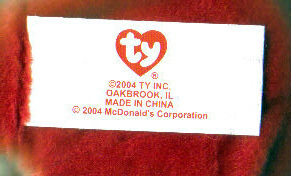 I guess it is a mystery for only Ty to know! 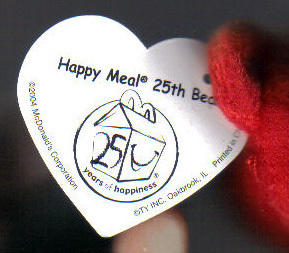 Employees of McDonald's were allowed to order a special boxed addition of the Teenie Beanies - 25th Anniversary Happy Meal Collector Set. 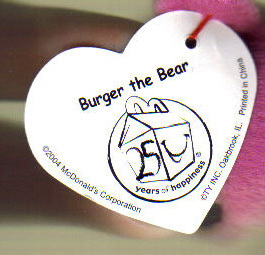 Items that were on display at McDonald's to help promote the Teenie Beanies included posters, and 3D displays featuring the actual Teenie Beanies! 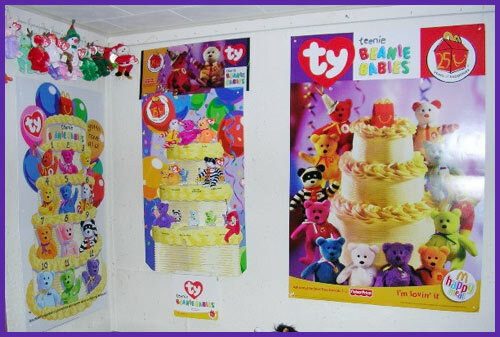 Thank you to David for sharing a picture of some posters he received from his local McDonald's.